"Close your eyes and just BE." --From "Write Your Life!" Welcome to Week One of WRITE YOUR LIFE! A quiet spot to meditate. If you don't have one or more of these things, no biggie, just do the best you can with what you have and you will be just fine. Now let's get started! 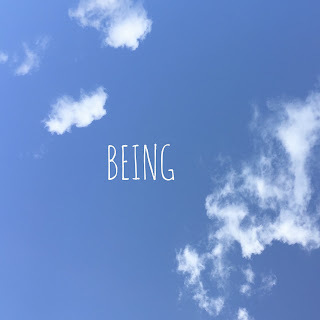 Week one is about BEING. Just BEING. That's it. In the fast-paced, ever-changing world we live in how often do you take the time to just BE? Not very often I would wager. So give it a try this week. First find a comfortable position, sitting cross-legged on a pillow or blanket, or in a chair with your feet flat on the floor, or even lying down with your arms at your sides and your legs splayed out in front of you (in corpse pose). As you breathe IN, fill your lungs completely with air, all the way to the top. As you breathe OUT release all the air in one big WOOSH with an open mouth. Repeat two times. Breathe IN....breathe OUT. Breathe IN....breathe OUT. Now close your eyes and just BE. There are no other instructions, Don't follow or regulate your breath. Don't visualize anything or count down from one hundred or chant OM. Don't DO anything. Just BE. Most likely you will not be able to do this perfectly. Your mind may wander. You may find yourself thinking or counting or making your grocery list. If this happens, don't panic and don't judge yourself. Simply STOP and just BE once again. Do this as often as necessary. Sit for as long as you are able. Twenty minutes is a nice amount of time, but if that is too much for you right now start with five or ten minutes and work up to twenty as the week goes on. If you are having a busy day and simply don't have that much time, do this for just one or two minutes. Even a minute or two is better than nothing. Make time every day this week to just BE. Check back daily for inspirational quotes to support you on your journey of BEING. Labels: BEING, Being & Becoming, Manifesting the LIfe You Desire, Meditation, Write Your Life!